When trying to run a unittest for my Python class, PyCharm under Windows is failing to import the actual class into the unittest. My project settings are attached. Please, try to print sys.path to console and attach output. drwxrwxr-x 3 silver silver 4096 Aug 28 17:50 .
drwxrwxr-x 6 silver silver 4096 Aug 29 19:13 ..
drwxrwxr-x 6 silver silver 4096 Aug 29 19:13 .
drwxrwxr-x 16 silver silver 4096 Jul 30 18:40 ..
['C:/westsoft/vbet5/swarm/trunk/test', # <– forward slash?? See those forward slashes? Are those legit Windows paths? My tests (running in Windows) have the same output (with forward slashes) and run well. But when trying to import anything from the file parser.py I have the same traceback output. Please try to rename your parser.py file and tell if it helps. thanks for pointing this issue out! 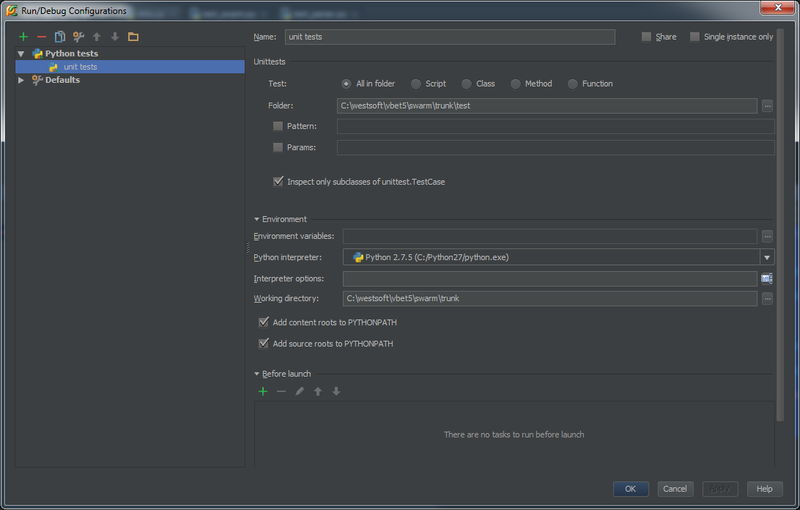 Fix'll be available in next PyCharm EAP.